The noise on the street in Chennai is deafening. Everybody honks. Cars have a high-pitched beeping sound. Buses have a loud, deep bass. Trucks are melodious two- or three-tone sound. Auto rickshaws are like a party melody balloon. Even if you are not driving by yourself, never-ending beeps would annoy you, frustrate you and tire you – until you get used to it. The locals don’t seem to mind the noise. Then you will find an interesting sign or a sticker on the back of the trucks, reading “Please Horn.” Ha. So, not only they don’t mind the horn, but they rather want it! The latest issue of Outlook Magazine, one of the widely published Indian weekly magazine, conducted a country wide survey on Happiness. It says 85.5% of urban people in India think they are either very happy or happy. Yes, 85. This is a striking contrast to what I saw recently in the major cities of developed countries, where the ‘Occupy’ protesters waved a placard saying they were 99%, shouting that only 1% of their population dominates the wealth and the rest is unfairly exploited, or unhappy. How could this happen? The United States, Europe, and even Japan think that their majority are unhappy, after all the hardwork on economical and social development, while India, with less than 1/10 par capita GDP of these developed countries, thinks they are all happy. Some of my friends posted an interesting flowchart to tell you which social networking service you should use in which occasion. What do you think? If you think it’s pretty good, you have a problem in Japan. The landscape of social networking in Japan is quite different from the other part of the world. Workplace Suicide – Why Do Japanese Business Persons Kill Themselves? 2,376 – The National Police Agency of Japan has just announced the monthly statistics of suicide for October 2011. At the current rate, it will most likely reach at 30,000 by the year end. The annual total has been exceeding 30,000 for the consecutive 13 years. Japan’s suicide rate, the number of suicides per hundred thousand people, is known high at 25, ranked in the top 5 in the world. The US and India are ranked around 40, or 10 suicides per hundred thousand. So, you may ask why. Let’s look how suicide has been regarded in the Japanese history. A good motivational book for a two-hour easy read. Like other good management books, such as ‘One Minute Manager,’ this book is written as a fictional story with a hint of mystery. The story goes as a middle aged salesman, SSS, starts questioning the purpose of his life and initiates the pursuit to find the answer with the help of a mysterious millionaire. 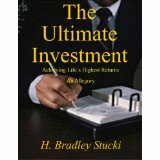 You as the reader go through the same struggle with SSS and, by the time you finish the book, you will be enlightened with the great concept of the Ultimate Investment. The Most Efficient Traffic System – Japan, US, or India? When I came to India for the first time, the biggest culture shock I had was the traffic. Cars, trucks, buses, scooters, auto rickshaws, bikes, pedestrians, cows, buffaloes, goat, dogs, roosters. They move towards the direction they want to go. The density of the traffic seemed hundred times more than the one on highway I-65 near Nashville, Tennessee. If you define the efficiency of the traffic system as the number of people (or cargo) transported for a given distance during a given time, you could say India has the most efficient system. Why? This formula can answer you.